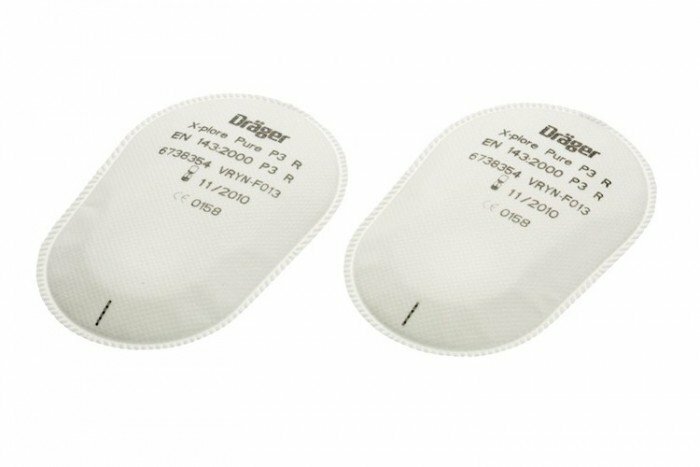 Drager’s Pure P3 R bayonet filters are suitable for a wide range of applications involving dust particulates. They are suitable for use with the X-plore 3300 and X-plore 3500 half masks and also the X-plore 5500 full face mask (all of which have bayonet connections). 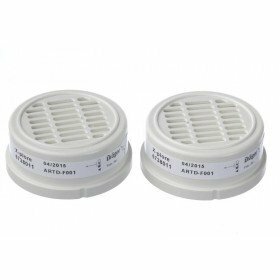 These Pure P3 R filters from Drager Safety are part of their range of Bayonet twin filter range. This particular set of filters can be used with the Drager X-plore half masks X-plore 3300 & 3500 and the X-plore 5500 full face mask (all which have a bayonet connection). Please Note: This pack contains 10 pairs (20 pieces). The bayonet filters have a protection class of P3. This indicates how efficient the filter is in filtering out particles. P3 indicates that the filter is 99.95% efficient. The ‘R’ indicates that this particular filter has been certified for reuse (more than one shift), however it’s important to be able to tell when your filter can no longer offer protection. Despite this type of filter being used individually as a particle filter it is possible to convert it into a combination filter (protecting against gaseous vapours also). The Pure P3 R filter from Drager can be combined with your chosen gas filter (with bayonet connection) and an adapter (p/n 6738356) to create a combination filter. Choosing a face mask and filter is not easy unless you know exactly which level of contaminants you’re facing and what your Occupational Exposure Limits are. The following guide will point you in the right direction and make you aware of some of the issues you need to consider before you choose your face mask and filter.